While we might not always trace the idea back to Aristotle in the Poetics, most of us are familiar with the idea that art imitates life. In fact, we're more than simply familiar with such a concept. We know it. Intimately. Perhaps we've experienced the adage while viewing the realistic works of Éduoard Manet or Edward Hopper. Such experiences, of course, aren't limited to canvases in museums. Maybe you've cringed or, like the woman seated next to me in the theater for a recent viewing of the film Twelve Years a Slave, covered your eyes while watching an extremely realistic movie. Even the casual reader has likely read fiction or poetry that illustrates clearly that the great philosopher was correct in claiming that "all delight in works of imitation." This power of "imitation" is one of the primary reasons I find myself drawn time and time again to the works of authors such as Wendell Berry, Wallace Stegner, and Marianne Robinson. Usually, though, I haven't found the same experience when I read historical fiction. Usually, but not always, as I found recently while reading Susan Stinson's novel on the First Great Awakening. 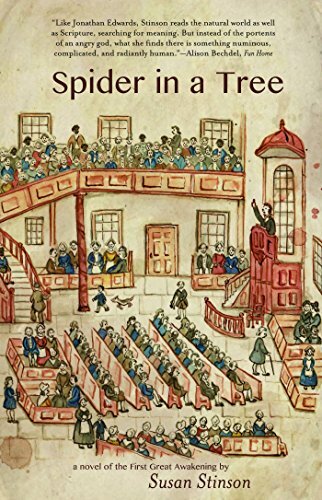 And I suspect that many readers will come away from Spider in a Tree, as I did, not only marveling anew at art's ability to imitate life, but also recognizing that the best art informs and influences our grasp of life.